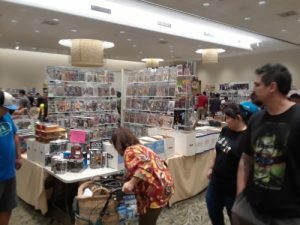 Photographic proof of the dealer’s room. Inspired partially by a binge listen to Diversity and Comics and partially by several young daughters who enjoy finding ways to fly their own nerd-flags, I found myself at a small local comic and toy expo this past weekend. After milling about and finding a few things for the girls, I left empty handed. A shame, really, but the old IP just doesn’t sing to me the way it used to. All the star wars and Marvel paraphernalia that once would have intrigued me just looked stale and lifeless. What’s the point of finding a Captain America shirt at a show like this when you can’t turn around inside a Wal-Mart without finding one staring back at you from the shelves? A part of me also found it harder than ever to part with my hard earned cash for a banner to nerd culture that would make me feel needlessly conspicuous were I to hang it someplace where others could see it. Sure, it would spark a few conversations, but as a guy with serious reservations about all of the recognizable IP out and about these days, those would be awkward conversations. It would present me with the choice of talking like a hipster who “liked it before it went Disney” or trying to explain the Pulp Revolution in a light, water cooler conversation. And let’s face it, the vital role the PulpRev is playing in the gathering cultural storm isn’t exactly the kind of fluff that flies around the modern day water cooler. Which leads to an interesting observation about how Alt*Hero offers not just a return to the glory days of comics, when the story and the action and the adventure all came before the politics and the messaging. It also offers a chance to recapture that sense of being in on an open secret. Thirty years ago, it took a sort of bravery to wear an shirt with a d20 on it in public – it marked you as somebody who enjoyed things that polite society took a dim view of, but which you recognized had a meaning and value they just couldn’t grasp. It was, in some sense, a thumb in the eye of the accepted social norms. An admission that you didn’t care what others thought, you were going to let your nerd flag fly. Backing Alt*Hero feels exactly the same. It feels like you are in on something great, something that the vast masses have missed out on, and which they might never understand, but which you recognize instinctively. This time around, with experience on our side, we intellectual and political rebels have more hope that the masses will circle around, but just as before, we sleep easy in our apathy toward their opinions. It would be nice, but if they always reject the Alt*Hero brand…it’s not skin off my nose – I’ve still got the books to enjoy.